Zong launches online recharge service in Pakistan. The service is named as Zong AnyTime. Now with this service Zong customers can recharge their prepaid mobile accounts online via any ATM Card, Debit Card and Credit Card which are powered by Master or Visa. Both Postpaid and Prepaid users can avail this service. Postpaid customers can pay their bill online and prepaid customers can load their mobile accounts online. This is the first of its kind service which is backed by any cellular service provide in Pakistan. Zong AnyTime service is powered by EPG (Etisalat Payment Gateway). Etisalat and UBL online payment system. There are no additional charges for charging Zong account using this facility. Some Banks may require to activate a session for online transactions through a call on their helpline. If your transaction is denied, please contact your card issuing bank to activate the session for online transactions. Go to or visit o2o.zong.com.pk/o2o/ Zong AnyTime Online Portal. This first page requires you to enter your mobile number in the specified format, amount of your recharge and security verification code that will be sent to the number entered by you. You will be redirected to a second page powered by UBL and Etisalat which requires you to enter your card account details i.e. your Card Number, Card Expiry date and CVV2 Code (3 digit code at the back of your Card). A confirmation message will be displayed after your transaction is successful. For further inquiries and / or Complaints, please dial 310 or your Card Issuing Bank. The maximum amount that can be transacted on any one number in any 24 hour period is PKR 999 for Pre-paid and PKR 2,000 for Post-paid. You can only do a maximum of two transactions (whether Pre-paid or Post-paid) using the same Credit / Debit Card in any 24 hour period. Please note that Zong on its website does not require you to enter any of your Card Account Details and consequentially does not store or maintain your card details to ensure card account information security. The Card details required during the transaction are entered on a portal maintained by a third party (Etisalat) under global recognized PCIDSS requirements (Payment Card Industry Data Security Standards). There is no refund or reversal of your transaction, so please verify the transaction amount before your proceed. Please ensure that your power supply and Internet connection remain active through the transaction. If you believe that an amount has been deducted, but the recharge amount has not been credited into your account, please dial 310 to lodge a complaint. 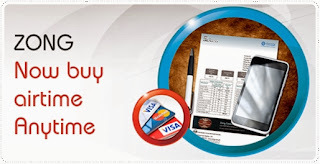 You must use your own card to make payment online. Incase, payment is made through any any counterfeit or stolen credit / debit card Zong reserves the right to block the service and recover the dues.